A visit to the Bread maker makes an excellent day out – watch and even help with the preparation of the dough, and end up beating the bread! Explore a beautiful Saxon village, the fortified church, after seeing the bread being taken out, enjoy a wonderful courtyard lunch full of home grown ingredients. 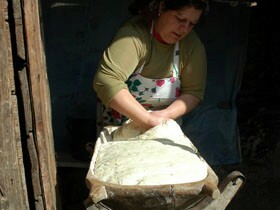 The traditional bread makers in Tarnava Mare have captured the imagination of tourists. Through the work of Fundatia ADEPT, local bread making was energised by the desire for tourists to learn about this fascinating traditional technique, now the demand for loaves outstrips supply. Traditional sour dough bread is made in a hundred year old bread ovens in an old traditional Saxon house of Tarnava Mare. The starter dough, saved from the previous bake, is mixed with flour (typically 20 kg) and water to start the fermentation process and left overnight. Early the next morning the dough is kneaded before being left to rise for approximately four hours in a traditional poplar wood tray. The oven is prepared by burning branches and twigs until the desired temperature is expertly reached and the coals raked to the side. The dough is carefully handled and placed directly on the floor of the hot oven using long handled wooden shovels. Some use oiled baking tins to get more efficient use of the space in the oven and use cabbage leaves on the base of the tins to extend the shelf life of the bread. Now is a good time to take a walk around the village and perhaps explore the church, returning within two hours to see the bread being taken out of the oven. By now the crust is jet black and while still hot is beaten with a wooden stick and then scraped off, revealing a golden brown loaf of bread underneath. Tourists interest in this unique bread is helping create local demand which will keep this traditional process alive. Most of the breadmakers you can visit can also prepare the most wonderful courtyard lunches for groups – with ingredients from their gardens, and for those with sweet tooths, wonderful cakes – often with the jam they make as a member of Saxon Village Preserves.